One of the few remaining small-scale commercial works by the great New York architect George B. Post, 4 East 39th Street was originally the home of Keppel & Co., a renowned art gallery that alternated exhibitions of Old Masters with those of contemporary American artists – thus the remarkable likenesses of Rembrandt and James Whistler that regard pedestrians from either side of the original arched entryway. Built in 1904-1905, Post’s design is a characteristically witty classical/gothic hybrid featuring a castellated parapet bracketed by a pair of formidable gargoyles. Later tenants include the distinguished architectural firm of Delano & Aldrich and, in the 1940s, the master designer Russel Wright (no relation to Frank Lloyd), whose line of ceramics and household wares were significant developments in American industrial Modernism. Wright’s Hudson River Valley home, Manitoga at Dragon Rock, is open to the public as a museum and is well worth the visit. 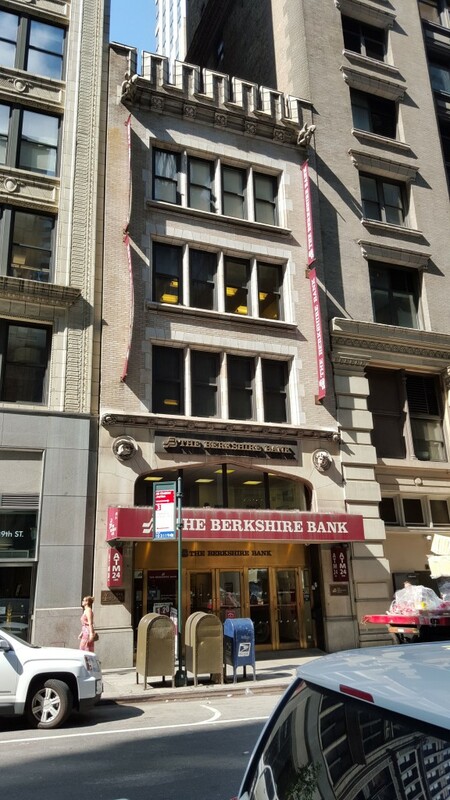 As for Keppel & Co’s former home, 4 East 39th Street has been converted into a bank but otherwise remains nearly completely and delightfully intact.